The blue rose - a mystical object of unobtainable beauty. 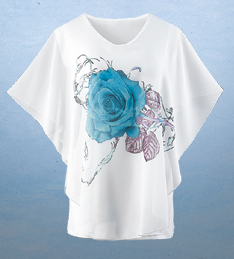 One blue rose blooms front and back on this floaty top, a curved, airy layer of chiffon over a silky, stretchy shell. 27" at longest. Imported. Polyester/spandex; machine wash. Sizes S-XXL.